This blog post was originally published on the BBC TV Blog. It shouldn’t have been this wet. The 4 x 4 slid across the muddy track like it was an oil slick and slammed into the bank on the edge of the road, almost knocking us all out. Water buffalo stood sodden and dripping with rain in the centre of the road, staring with a blank aggression as though they might charge at any moment but unable to decide if they could be bothered. It’s week three into our filming trip to Kenya for the series Secrets Of Our Living Planet and we’ve come to one of the most famous stretches of grassland in the world, the East Africansavannahs, to capture some of the incredible connections between the animals here. One of the greatest things about the reserves and conservancies of East Africa is simply the density of animals. In many cases there is no need to wait around to see a big, hairy and often deadly African animal because you’ll probably stumble upon one without even trying. Elephants are on the roads, lions roar all night just metres from your tent and you can even walk into a one-tonne buffalo while on your way to breakfast – as I did one bleary-eyed morning last week. So filming animals in this environment should be a breeze right?! Well, think again. For Secrets Of Our Living Planet we were looking for remarkable relationships between animals, many of which have not been shown on TV before, and this more than anything requires planning, patience and a bit of luck. Unfortunately today our luck began to run out, albeit briefly. We were out to film the white rhino which has been reintroduced to Kenya and has a vital role to play in Africa’s grasslands. Thanks to large mouths and hindgut digestion white rhinos can eat their way through a lot of tall dry poor-quality grass that many other African grazers can’t eat. That allows the other smaller-mouthed antelopes to access the quality grass that grows up once the grass is cut short. In many ways the rhino is like a giant lawnmower on the African savannah – keeping the grass short and sweet. On our team was Steven, a rhino patrol officer who manages a team of watchmen – sentinels who follow and sometimes even sleep out with the white rhinos to monitor their movements. Early one morning we followed the dust kicked up by Steven’s motorbike as he took us to the site of the latest rhino sighting. Slowing on the approach so that the sound of the engine wouldn’t scare off our quarry the cameraman and I jumped out of the car onto the cracked earth. The rhino was now in thick bush and we could no longer track it with the car. To film it we had to go in, but following an animal the size of a car and armed with a giant horn into the bush is not something to be taken lightly. In such a situation your imagination might lead you to expect that you will soon be making a swift exit with a big animal on your tail. However in reality there was only one way to find out. Led by Steven, keeping low on the ground and trying to keep out of sight, we managed to film a group of three white rhinos. However our swift exit came soon enough. In a strange turn of events for dry season Africa the sky had turned black and it was pelting hail that chased us out of the bush and back into the cars. Within minutes the roads became rivers and we slipped and skidded our way back to camp. 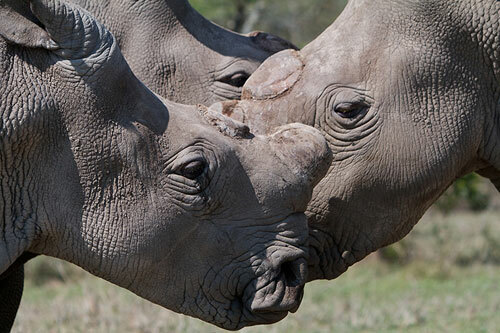 We hadn’t quite managed to film the white rhino behaviour that we wanted on that day. As with all natural history filmmaking many things are filmed that end up on the cutting room floor – and this was just one of those occasions. It was a few days later that we filmed the scene that made the final cut, in our next and most remarkable encounter with the white rhino. This time luck was on our side: the sun was shining and the rhinos were out on the open plains where they sometimes feed in the morning before retreating into the thicker bush in the heat of the day. Jasper Montana was the researcher for Secrets Of Our Living Planet and location director of episode two, The Secret Of The Savannah.